Ah- Vermont! Best known as the Green Mountain State, for being one of the smallest states both geographically and population-wise, and the home of beloved ice cream brand Ben & Jerry's. Lesser known as the home state of Annaliese from April 2017-March 2018. While Vermont didn't work out to be my long-term home, I definitely have a new appreciation for it as a special type of vacation destination. Vermont really is its own unique state- it's also quite different from other New England states! I'm originally from Maine, so I thought moving to Vermont would be an easy transition. While both states do have very rough and long winters in common, I'd say overall they are quite different culturally. Anyways, Vermont is a popular winter vacation destination for skiers, but if that's not your thing then summer would be a great to visit! This could be a lovely summer vacation spot if you're from a large city, a very different part of the country geographically and looking for new scenery, or just used to living a fast-paced lifestyle and needing a few days off from that. Vermont is a place to slow down, enjoy nature, enjoy local cuisine, and just... breath. Definitely a great spot for a unique type of summer vacation! I had written a few posts previously during my time living in Vermont with some local recommendations, but I'd never officially written a full travel guide! I figured now was the time to do it, with the summer travel season just kicking off, and things still being fresh in my head from recently living there. 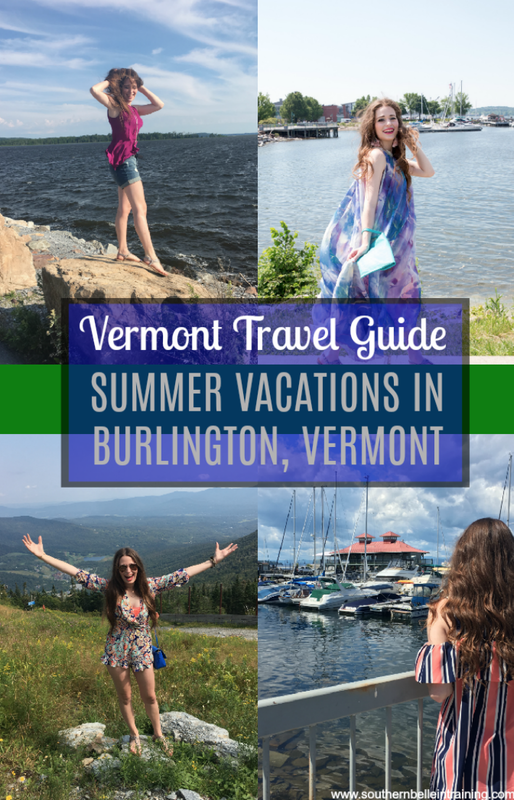 This guide will focus specifically on the Burlington area, since that's where I lived and worked! A few travel facts: Burlington is Vermont's largest city, although it's the smallest biggest city out of all 50 states! The population of Burlington is under 50,000 people- isn't that crazy?! Burlington is located directly on Lake Champlain, in the northwest corner of the state, just under an hour from the Canadian border. Southern, central, and northeastern (called the Northeast Kingdom) Vermont are also popular vacation spots, but I'm obviously most familiar with the Burlington, Chittenden county, and Lake Champlain areas, since that's where I lived during my time in the state. Burlington is in the northern part of Vermont, right on Lake Champlain. If you're coming from outside of New England, flying is probably the easiest way to get to Vermont. The Burlington International Airport is actually the only commercial airport in the state! It's pretty small as far as commercial airports go, and therefore can be expensive to fly into, but it's definitely the most convenient option for flying. They do offer direct flights to most major airports on the East Coast. (The next closest airport is actually international- in Montreal!) Driving to this part of Vermont is also an option- Interstate 89 runs through Burlington, and Route 22A is another popular way to get up to northern Vermont from where the southern part of the state meets New York. Where a lot of things in Vermont are spread apart from each other (it's a very rural state), if you do fly in, I highly recommend renting a car! There is Uber and Lyft in Burlington, but they don't run too far outside of the city limits. Courtyard by Marriott Burlington Harbor, Burlington: This is one of the nicest hotels in downtown! It's in walking distance to Church Street Marketplace, (where most of the downtown shopping, restaurants and bars are), and many of the guest rooms have stunning views of Lake Champlain. Since Burlington is such a tiny "big" city, this is also one of the tallest buildings in both Burlington and the entire state- fun fact! I haven't stayed here myself as a guest, but I am quite familiar with the hotel as I have rapelled off of the building! I did a rapelling event for charity (representing the radio station I worked for in Vermont) last September, and this took place at the hotel! Hampton Inn Burlington, Colchester: This is the hotel that I stayed at during my job interview trip! Colchester is the quaint lakeside town located just north of Burlington, and hotel prices can be a bit cheaper staying here since it's not right in the city. This hotel is located right on I-89, so it's conveniently located to get to downtown Burlington, the airport, or destinations north or south for day trips. Green Mountain Suites Hotel, South Burlington: My friend Shara stayed here when she visited me last fall, and I visited her there and we swam in the pool together! I didn't even know this hotel was here before she told me she booked it, but I was so impressed with it. The lobby of the hotel has a cozy ski lodge vibe, and it's a huge property! The indoor pool was also really nice. This hotel is located in South Burlington, very close to the mall and the University of Vermont, about 10 minutes from downtown Burlington. The Essex Resort and Spa, Essex: This is a luxurious inn, with a full service spa and restaurant on the property! It's located in the nearby town of Essex, which is about 20 minutes from Burlington. I haven't stayed here as a guest, but I did go visit the spa for a manicure last summer, so I got to see the hotel up close and personal, and it's very nice! It's not cheap to stay here, but it would definitely be a relaxing and nice experience! I have previously shared a guide to my favorite Burlington and Chittenden County restaurants on the blog! You can check that out here. *Hiking and nature trails: There are lots of different types of hiking trails in drivable distance from Burlington! Everything from walking trails to more strenuous hikes. I shared some of my favorite trails in this blog post! *Explore Church Street Marketplace: Church Street in Burlington is the heart of downtown, and it's also a pedestrian-only walking street filled with local shops, restaurants, and some nightlife. This was one of my favorite parts of Burlington (I did a lot of my blog photos here! ), and whenever I had company in Vermont I'd usually take them to eat at a restaurant on Church Street, or at least for a walk up there and to window shop at some of the stores. *Eat the best maple creemee in the state: Here's some weird Vermont slang for you: Vermonters call soft serve ice cream "creemees." ...Weird, I know!! That name never really grew on me. Anyways, the most special type of Vermont creemee which really can only be found there are maple creemees, made of course with local Vermont dairy products and maple syrup! I had my fair share of maple creemees during the summer I lived there, but I truly believe the BEST maple creemee to be found is at a little off-the-beaten-path place called Palmer Lane Maple in Jericho (about 30 mins from Burlington). This place is 100% worth the drive, and their homemade maple soft serve is unreal!! They also sell maple syrup there and other maple products. *Have a drink at a waterfront bar: I don't think either of these made my restaurant guide, so I'll include them here! Burlington is located right on Lake Champlain, and this part of the lake has beautiful views of the Adirondack Mountains on the other side in New York. You'll want to spend some time gazing at the lake, and enjoying an evening at one of the waterfront bars is a great way to do that! My two favorites were Splash! At the Boathouse and The Spot. Both of these bars are seasonal and only open in the spring/summer! I also wouldn't really recommend the food at either- both have very overpriced and limited menus since they're lakefront bars. However- the drinks are fabulous at both! The Spot makes one of my favorite mojitos of all time. Splash! is located on a floating dock attached to a boathouse so it has a real nautical and casual feel, and The Spot almost has a very modern city rooftop bar vibe (except it's right on the lake and near the ferry terminal). *Visit the Burlington area breweries: Burlington and surrounding towns are a huge area for craft beer! I didn't really take much advantage of this while I lived in the area- I only visited Citizen Cider in Burlington and Goodwater Brewery in Williston. Other notable ones in the area are Queen City Brewery, Switchback Brewery, Zero Gravity Brewery, and many more! *Take a lake cruise on the Spirit of Ethan Allen III: Continuing with our Lake Champlain theme, going for a lake cruise would be a great vacation activity! This had been on my bucket list last summer, and I finally got to do it with my dad on one of his visits. The Spirit of Ethan Allen cruise company offers daily lake cruise excursions- some offer meals, and I think some are even themed! We did the standard sunset cruise. I really enjoyed getting to see unique views of Burlington and the mountains from the middle of the lake! *Rent kayaks or canoes: Another way to experience Lake Champlain by boat is to paddle yourself around! There are many companies in the area that offer canoe or kayak rentals. My dad stayed in Colchester visiting me for a week last summer and his rental home came with kayak usage, so we spent a morning kayaking on the lake which was so much fun! I wish I'd gotten the chance to do more of that while living there. *Beach day at Sandbar State Park: Lake Champlain sadly isn't known as the cleanest or best lake for swimming and beaches, due to a variety of factors including its sheer size, boat traffic, and its other uses. However- one great beach that I fell in love with last summer (and is one of the safer ones for swimming!) is Sandbar State Park, on the Colchester/Milton town line. There is a beautiful sandy beach here, and you can see amazing views of both the Champlain Islands and the mountains. This state park is located right off of US 2, which I talk more about further down in regards to doing a drive through the Islands- so you could combine both of these things into one day! *Waterbury food activities: Ben & Jerry's Factory, Cabot Annex and Cold Hollow Cider Mill : The little town of Waterbury is about 45 minutes south from Burlington on I-89. Waterbury is a pretty small community, but there are a lot of unique Vermont food opportunities to be found there, so it's worth spending an afternoon there! Most notably, the Ben & Jerry's factory is located in Waterbury, which you can tour! The factory is open seven days a week, and has tours running throughout each day. The tours are brief but fun, and would be a great family friendly activity. They also have a gift shop and ice cream shop on site! Just about a mile or two down the road from Ben & Jerry's is one of my favorite places in Vermont- the Cabot Annex store! Cabot Cheddar is one of Vermont's most famous cheese companies, and one of their factory stores is in Waterbury. It offers unlimited samples of 20-30+ of their cheeses... so if you're a cheese enthusiast like myself, this store is a dream! Cabot cheeses are sold at chain grocery stores nationwide, but the Cabot Annex store does have some special varieties of cheese that most grocery stores don't carry, and the prices are great! And lastly, Cold Hollow Cider Mill is also located in Waterbury! Their peak season is fall when the apples are ready to be picked, but Cold Hollow's store is open year round, and sells all sorts of local Vermont food items (they have tons of maple items!). 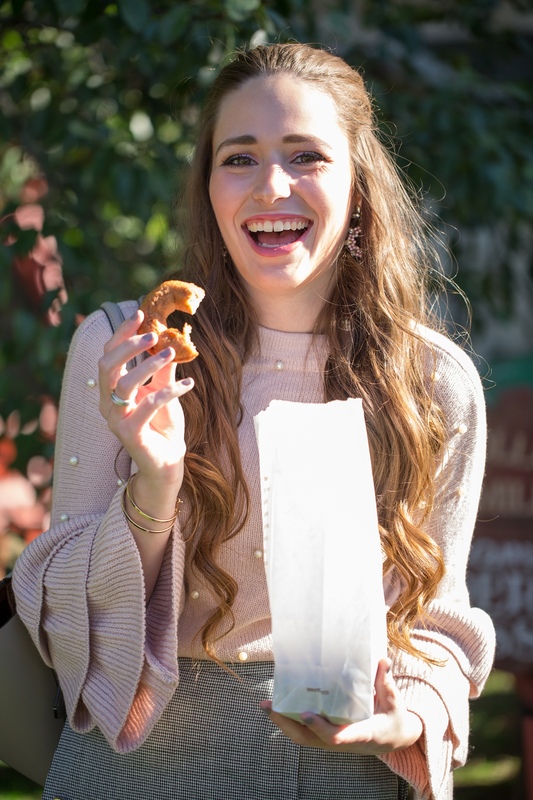 Most notable to me are their apple cider donuts! *Ride the Mt. Mansfield Gondola in Stowe: If you're a lover of the mountains, Stowe is a must-visit! It's the most charming little village town, right smack in the Green Mountains, and about an hour from Burlington. It's also the same highway exit as Waterbury, so you can make it a day trip and also do the food activities mentioned above! My favorite activity in Stowe is riding the gondola up Mount Mansfield, which is the tallest mountain in the state of Vermont. The views are breathtaking, and it's a really unique thing to do! My mom and I did this on Labor Day last year when she came to visit for my birthday, and it was such a great day. 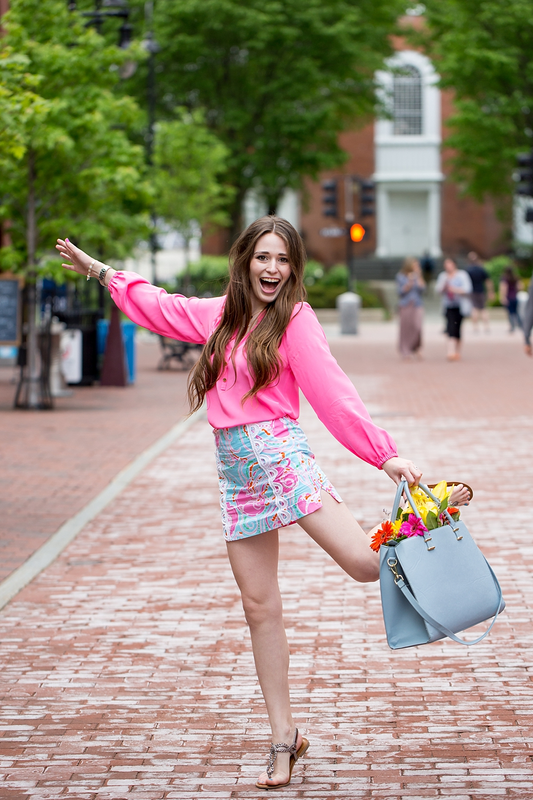 *Shop at Pink Colony in Stowe: If you make it to Stowe for some mountain adventures, you must stop at my favorite Lilly Pulitzer specialty boutique! They're bringing preppy, colorful style to Vermont, and the store is absolutely adorable. I did two blog collaborations with Pink Colony while I lived in VT, and now love keeping up with the store via Instagram!! *Drive US 2 through the Champlain Islands: Lake Champlain has several large islands in the middle of it, in between Vermont and New York. The largest ones are connected to the mainland via US 2, and do have some year-round residents! This is also where Vermonters go to pick up the ferry to go across the Plattsburgh, NY. Anyways, the Champlain Islands are absolutely stunning. The landscapes are completely different from the rest of Vermont and upstate NY, and driving through in the summer is unbelievable! When my friend Ciera visited last summer, we took the scenic and longer route coming back from Montreal, and drove through the entirety of the islands. We were in so much awe that we just drove and drove and barely even spoke during the drive- our eyes could barely contain the natural beauty we were seeing!! Honestly - I really do wish I'd had the chance to drive through here one more time before I moved. *Cross the border - day trip to Montreal or shopping at Dix30: If you have a passport or live in a state with the enhanced license program- take advantage of this if you're visiting Vermont!! Burlington is just under an hour from the Canadian border, and Montreal is just under two hours away. Montreal is the most amazing city- I wish I'd explored and visited more times while I lived there! I have a Montreal Travel Guide here, and a guide specific to my favorite shopping center near the border, Dix30, in this post! 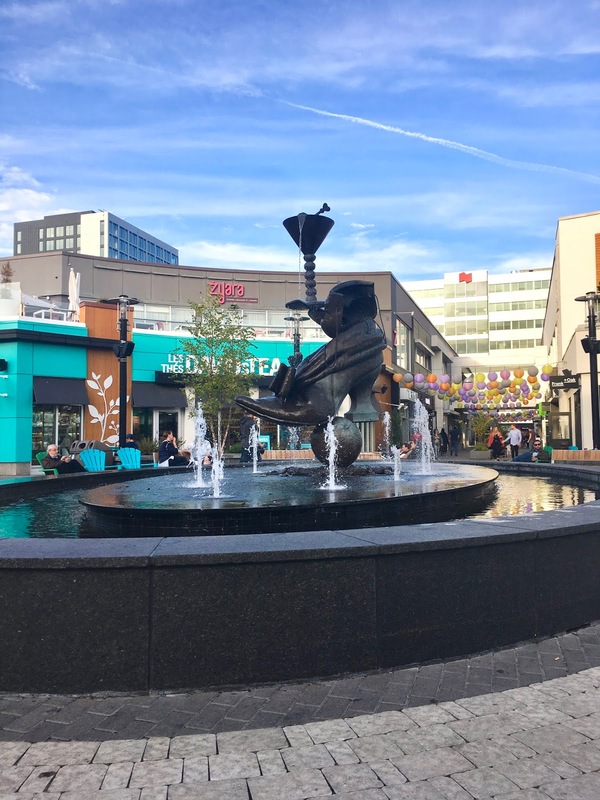 Dix30 is the most amazing outdoor mall and lifestyle center- it's only about an hour and a half from Burlington and so worth a trip, especially since shopping in Canada is to the US dollar advantage right now! Whew!! Alright being totally honest- I didn't realize I did this many things during my time in Vermont last year, haha! I guess I definitely did more things last summer than I thought. All of these activities would be awesome summer vacation activities in the Green Mountain State. Have you visited Vermont before? Or are you planning any New England trips soon? I've been to Vermont both in the middle of summer and the middle of winter, and while I'm a bit partial to the snow, I couldn't believe how gorgeous and green the state is in the summer! You definitely can't beat mild summer temperatures, gorgeous mountains, and fun breweries! I've never ventured up North on vacation, but Vermont sure does look beautiful (for a short stay, anyways ;) My husband would probably love to visit in the winter, he loves to ski! Omg yes to all the drinks there! Looks like you had a great time in Vermont! So many fun recommendations for Vermont!! You did a great job covering all the bases!! Ah so cool there is a gondola! I'm so used to seeing them here on the west coast but have no idea there was one in Vermont! This looks like it was such a great trip! I mean, they have everything. I know you didn't enjoy living in Vermont but it does seem like a beautiful place for a trip. That luxury hotel where you got the manicure sounds so relaxing, I love a hotel with a good spa! I also would love to visit Montreal, I've heard it is a really cool city. I went to UVM for a semester and when my RA asked if some of us wanted to get a creeme I was so thrown off. Can't say the name every grew on me either! I always felt that New England would be a great summer destination, I'll definitely look more into Vermont! What a cool place! I've never been to Vermont but I would love to go-- it looks so quaint and I love all the greenery! Would love to try some of these places you mentioned! I've never been to New England/Vermont but I definitely want to visit someday. I'll have to keep these spots in mind if I ever make it out there! 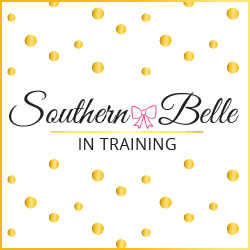 Love this guide!This looks like the perfect summer location to visit! A tour is always come with lots of fun and lots of new things. We can also get know many things about the place. By the way, are you wondering how to find a tour guide? Very simple. konsorts are providing world class tour guid only for you. Enjoy your tour.